In December 1931 a somewhat adrift 24-year-old washed up in Southern California, looking for something to do. A native of New Orleans, he was named Ernest Raymond Beaumont Gantt.Gantt made o in the Depression economy through his wits and odd jobs—working in restaurants in Chinatown, parking cars, and doing a bit of freelance bootlegging in the months before Prohibition ended. Sociable and charming, he befriended such Holly wood personalities as David Niven and Marlene Dietrich and through them found occasional work as a technical adviser on films set in the South Pacific. A couple of years after he arrived in Los Angeles, Gantt happened upon a newly vacated tailor shop just off Hollywood Boulevard. He built a bar that would seat about two dozen customers and scattered a few tables in the remaining space. He decorated the place with his South Pacific gewgaws, along with old nets and parts of wrecked boats he scavenged from the oceanfront. He called his watering hole Don the Beachcomber. Rum was the least expensive of the spirits, and Gantt had sampled a variety in his travels. 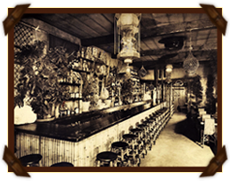 He devised an exotic menu of rum-based drinks that complemented his theme and scratched the names on a board behind the bar. The joint became so much part of his personality that he legally changed his name. Ernest Gantt was now Donn Beach. He was the inventor of the tiki bar, a new kind of place that, over the next 30 years, would migrate from the cities to the suburbs and beyond. When World War II broke out, his ship was attacked by a U-boat. Beach was injured, and after he recovered he spent the remainder of his enlistment in charge of hotels and restaurants where airmen could rest and recuperate—on Capri and in Venice, on the Lido and on the French Riviera. Donn beach remained a fixture in Honolulu until he died in 1989 at the age of 81. The New York Times ran a brief obituary that painted him as a sort of Thomas Edison of the thatched-roof bar and the inventor of 84 bar drinks.